Wireless computer network diagrams help system administrators and network engineers to find out amount and type of equipment needed for each office LAN. TheConceptDraw DIAGRAM software helps users to quickly transit from an idea to the implementation of a wireless computer network. Sample 1. Ad Hoc Wireless Network Diagram. 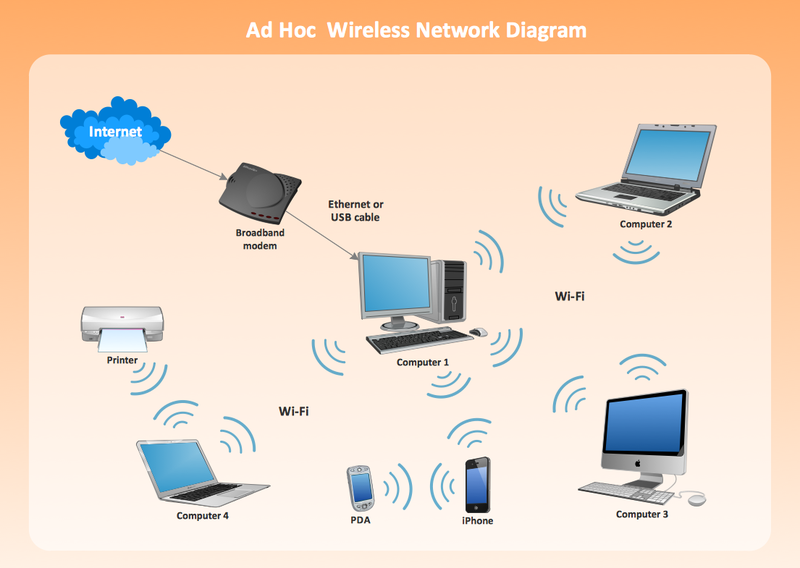 This example illustrate the topology of wireless local area network (WLAN). It’s quite a difficult task to manage the computer network today. But ConceptDraw DIAGRAM v12 with Computer and Networks solution can help to the system and network administrators plan, create and support the work of their networks. ConceptDraw DIAGRAM v12 diagramming and vector drawing software extended with Wireless Networks Solution gives the ability to its users to create professional looking WLAN schemes and diagrams quick and easy.